Effectively capturing, managing and leveraging raw data to derive meaningful business intelligence (BI) is requirement for enterprises today. In order to successfully guide present and future decisions, all levels of management must have control over this data and the business metrics it creates. These challenges usually require teams to build data integration and ETL processes, with business analysts defining business requirements and software engineers deploying the data integration technology. This ends up requiring a substantial proportion of an organization’s resources. We believe a business analyst should be able to design, deploy and manage the entire data integration process. Jitterbit’s powerful ETL tools and data integration solutions provide an intuitive, easy-to-use interface that simplifies data integration. The result? Organizations reduce development costs, increase effeciencies, and eliminate risk. Whether you are using ETL processes for Data Warehousing, Business Intelligence or legacy systems integration initiatives, Jitterbit is designed to handle even the most complex tasks. Jitterbit has native connectivity to all major enterprise applications, relational databases, flat files, XML, and SaaS/Cloud data. To handle large data sets commonly found in ETL initiatives, Jitterbit employs high performance parallel processing algorithms that intelligently synchronize disparate computing platforms in a shorter amount of time. 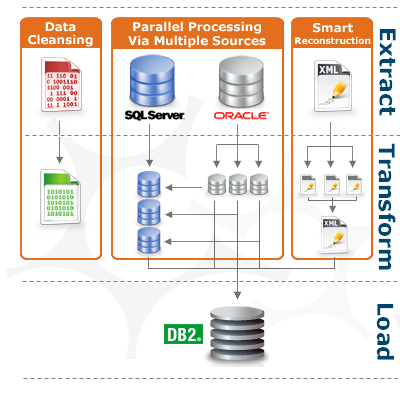 Data cleansing and Smart Reconstruction tools ensure that your data is extracted, transformed, and loaded with complete reliability. See how Jitterbit simplifies data integration in the Platform section.